Addressing your hardware begins with a simple visual inspection. Look for damage on the door, and if there is any major harm, call a professional before things exacerbate. If someone has driven into your garage door, you might not realize immediately, but a thorough look at things will give you an idea of whether you need to take things further. You can check for rust, look at the springs, tracks, fasteners, cables, and hinges, and look for any signs of damage. These play an integral part in lifting and lowering your garage door, so should be assessed thoroughly. If they seem dirty, you should immediately clean the cables with a toothbrush. This is especially important because they’re often exposed to moisture, and dirt and debris can build up there too. If the cable is past the point of repair with a good clean up, then you should phone a professional for help. 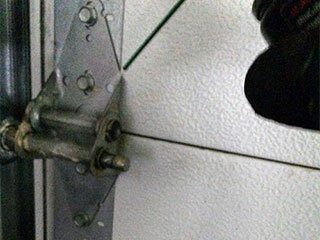 Grinding metal can cause garage door failure. Your garage door will naturally stiffen, but you can spray your mechanisms with white lithium grease. This will ensure things run more smoothly, so the torsion springs can run over the roller tracks as best as possible. Alongside this notion, just ensuring everything is clean will go a long way towards helping things run smoothly, so use a cleaner or lubricant twice a year.